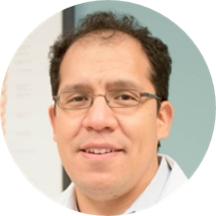 Jose Churrango is a caring and diligent gastroenterologist in Newburgh and Middletown, NY. Dr. Churrango obtained his medical degree from Rutgers, the State University of New Jersey. He completed both his internship and residency in internal medicine at same university. He completed his fellowship in gastroenterology at Rutgers, the State University of New Jersey. Dr. Churrango also holds a bachelor’s degree from Cornell University. Dr. Churrango is a part of Crystal Run Healthcare. He is board certified by the American Board of Internal Medicine. He is a member of the American Society for Gastrointestinal Endoscopy and the American College of Physicians. Because Dr. Churrango is bilingual in English and Spanish, patients from a variety of backgrounds enjoy having him as their physician. Dr. Churrango received the award for most humanistic resident and excellence in clinical skills in 2011-2012. He was also New Jersey Medical School’s Golden Apple Nominee for the 2010, 2012, and 2015. Dr. Churrango is uncompromising in his dedication to the well-being of his patients. He is committed to giving the best care and establishing long-lasting relationships with them. 2011-2012 Award for Excellence in Clinical Skills. 2011-2012 Award for Most Humanistic Resident. 2010, 2012, 2015 New Jersey Medical School Golden Apple Nominee. 2010-2011 Department of Medicine Award for Excellence in Clinical Skills. 2011 December Resident of the Month. It was extremely beneficial with the doctors help and the staff!!!! It was an unpleasant situation that he made as bearable as anyone could have. I appreciated that. Very pleasant and explained every thing. Extremely kind doctor. Thoroughly listened to my concerns and came up with a game plan on how to treat. I did not feel rushed at all and feel like Dr. Churrango really spent the time needed to assist me. Dr. Churrango was very attentive while taking my history and explained the exam thoroughly before and during the process. He called me promptly to follow up with results from radiology. Dr Jose was very professional and he explained in details what the procedure would be, very knowledgeable and I was so pleased with him. Her was absolutely amazimg. Not trying to offer procedures or anything that I can't afford. Very honest and willing to work with his patients. He does care and want his patient to feel at ease and have a sense of peace.